Mirrored rattle with colourful beads reflects light. Textured handle is easy for baby to grasp. 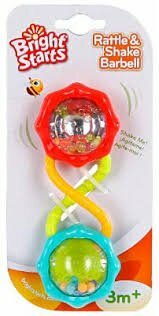 Multiple colors and rattle sound keep baby entertained. No batteries required. Mirrored rattle with colourful beads reflects light. Textured handle is easy for baby to grasp. Multiple colours and rattle sound keep baby entertained.